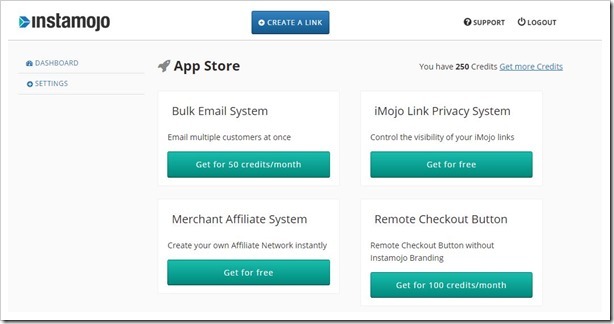 If you are unaware of Instamojo, it is basically a platform that allows users to collect online payments by simply creating a payment link, which can be then shared through any platform including through websites, emails, mobile messages or instant messengers. Instamojo was founded by Sampad Swain, Akash Gehani and Harshad Sharma in 2012. SocialPay Message: Sellers can customize default social pay messages. Among the 6 apps, sellers will find 2 apps quite useful to increase their sales – affiliate system as well as remote checkout, both of which are generally not available with other similar platforms. While some of the apps are free, apps like Bulk email and “remote checkout” carry a price. Sellers needs to buy certain number of credits to start using these apps. Overall, appstore is a great addition to already simplistic selling system that Instamojo offers. Sellers will undoubtedly find them quite useful. Also, as an introductory offer on the occasion of Instamojo’s 2nd anniversary, they have offered 250 Appstore Credits to all their sellers. So, sellers can also try out various paid apps without paying anything upfront. The offer is valid for all new registrations till 30th September 2014. If you are an instamojo seller, you should definitely try out the apps from their appstore – and if you are not, you should still explore the platform, because it is probably the simplest way of selling your product and services (especially if they are digital) online.